This is a guest post from Mwangi, as I know him from the Blog Mastermind program. He is by far one of my best students and an extreme-action taker. 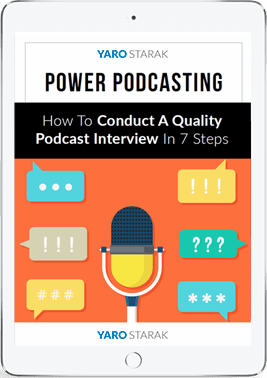 He came away from Blog Mastermind with a new love for Podcasting and has put together this guide for us on how to create a successful podcast. My blog features a lot of podcasts and has from the very early days. I consider podcasting one of the keys to my success as a blogger, and I hope with the help of Mwangi and this article you will decide to start your own podcast too. Mwangi recorded an audio version of this article, which for obvious reasons makes sense – you can’t talk about podcasting without including one. I also recommend you go grab Mwangi’s Podcasting Manifesto from MyPodcastingTutor.com if you are interested in learning more from Mwangi – it’s free. Hi! My name is Tony Chomba Mwangi Njanja (yup 4 names….including the English one 🙂 ) and I am a Blog Mastermind Graduate and Mentor. Thanks to Yaro, I not only have my own blog, but more importantly, my own podcast. While digging through the six months of Blog Mastermind lessons, I came across Lesson 17 on Podcasting. This lesson changed my life, and now, many months later, I have more than a dozen podcast episodes under my belt. I not only applied the lesson to my own podcast, I used the information to get in touch with and interview the best of the best of the best in the worlds of podcasting and video blogging. We aren’t talking about just anybody here. We are talking about the Yaros, the Paul Colligans and the Gary Vaynerchuks of the world. Below are 7 lessons that have come from the combination of my experience and their brilliant insights into how to take podcasting technology and use it to create your own media empire. As nice as the folks at WordPress.com, Blogger, Blogtalk Radio and Co. are, it is absolutely crucial that you’re in complete control of the rights and the destiny of your podcast. Head on over to places like NameCheap, Domains in Seconds and Dreamhost and get yourself a domain name. Host your site at places like Hostgator and Dreamhost. Get your own private servers once you outgrow shared hosting services. If your podcast begins getting some serious traffic, you might also consider paying for online storage services like Cachefly and Amazon S3. Use Feedburner’s MyBrand service or Paul Colligan’s Premium Cast to ensure the RSS feed is all yours. Finally, though I have no experience with these guys, it might be worth testing out services like Prove My Copyright to make sure your online copyright is protected. This isn’t a particular popular thing to say in this world where every marketer and guru wants us to believe that we can all be the absolute best at everything. You must choose an area where you can win. No, scratch that. Not just win, but absolutely dominate. After all, don’t we have enough mediocre podcasts around? Where you bring things to the table that no one else can. If you start out not knowing where you can be preeminent, that’s fine but make sure your end goal is to be on top of a mountain. For some of you, the idea of recording podcasts that don’t have a professional look and sound like they cost thousands of dollars to produce is about as appealing as a root canal. Below I have a couple of solutions for you. Before I get to them, let me remind you that ultimately, content IS king, not the pretty graphic in the corner. You want a living, breathing, ginormous (it’s a word: P ) example of this, look no further than the number one personal development blogger on Earth: Steve Pavlina. Steve Pavlina uses the default WordPress theme and yet he gets 2 million+ visitors every single month. Want another example close to home? Why not have a listen to the Entrepreneur’s Journey Podcast. Because of Lesson 17 and interviewing Yaro, I know exactly how he records his podcasts and I’ll tell you right now, you can have everything 100% setup in a couple of hours for less than $100. So content is the 80% that will produce results, the other stuff is the 20% on top. Now, let’s talk a little bit about these “cherries on top” shall we? One thing you must avoid like the plague if you want good sound quality is sound card microphones. They tend to record the noise of the computer fan and in general have terrible sound quality when compared to USB mics. Gideon Shalwick on his phenomenal video site, Get Your Video Online, recommends that you get yourself a Logitech noise cancellation microphone if you’re just getting started and can’t afford much. If you have a bit of money to spend, Yaro isn’t alone in recommending the Snowball Microphone as a great mid price microphone. It would also be useful to head down to your local sound store and get yourself a pop filter. Alternatively you can scroll over to Google videos and learn how to create your own pop filter at home at a budget price. I first heard about this from the Podcast Answer Man, Cliff Ravenscraft, who lamented about people who would buy expensive podcasting equipment only to abandon podcasting soon after. In general, you have to get to a certain number of podcasts before anyone (including yourself) can bank on whether you’ll stick to it. For some, after 7 podcasts, they are pretty sure about whether or not to proceed. For others, they need to put out between 8-15, and some even more before they know whether podcasting is for them. So, before you splurge on expensive recording equipment, wait until you pass the 7-15 podcast threshold and are sure that you’ll make use of the podcasting equipment over the long haul. Once you are sure you’re in the game for a long while, head on over to the Podcast Answer Man’s site, where he is ready, willing and able to give you free consultations and recommend equipment that best suits your needs. Many of you will probably be surprised by how cheap these two elements are. I located two royalty-free theme songs, for $20 each from Sound Rangers and Shockwave Sound. Update: In the middle of typing this post, I learned about a free site for getting royalty free music: Incompetech; clip quality isn’t as high as the other two, but good enough for the free price. Jingles aren’t restricted to television sitcoms and dramas. Geoff has created jingles and intro music for the likes of Paul Colligan, Adam Curry and Geek Brief TV just to name a few. So check out his site, get in contact with him and work on creating your very own custom made jingle. Sure many people have done very well purely on sponsorships, affiliate commission or selling other folk’s stuff but I defy you to find me one top level player in the Internet world who doesn’t sell their own stuff and/or work tirelessly on building their brand equity. And there you have it: 7 things that I have learned are needed to build a popular profitable podcast after an obscene amount of research, experience and interviews. My hope is that these tips are of use to you and help you on your way to creating your own podcast kingdom. PS. Download my Podcasting Profits Manifesto – a free report I created that offers many more tips on how to build a popular AND profitable podcast. and now Mwangi has answered these questions in this step by step article.Your students make you proud Yaro. Hey Tony, Thanks for the great tips. I found you on the Blog Mastermind forums and actually signed up to your newsletter just the other day. I think podcasting rocks, but I find that if you do a weekly show it’s hard to keep the motivation going, maybe I’m not a natural podcaster but it does feel like more of a chore for me. Thanks for sharing! First off, HUGE thanks to Yaro for posting this up. I will subscribe to this comments thread so I can answer any questions that may come up. @Vera: I am actually the exact opposite: I find it much easier to create a podcast, especially when I record them knowing I won’t edit the content and will only add an intro and the theme music: talking and interacting just comes easier to me. Hey Tony, Yes for me talking and chatting with people is very easy too. It’s the motivation I guess to edit it and put it all together, I guess I should just outsource this as a regular task. I was blown away by this article, and the report. Great stuff! Mwangi, you did a wonderful job laying it all out so even the newbie can understand what’s needed to get into podcasting. I have already forwarded this over to a few clients of mine. I’m sure we’ll be seeing more of Mwangi around the web! Some great advice here. I agree that it is important not to spend a fortune on great equipment until you have put some podcasts under your belt. Some people spend so much time worrying about the mechanics of podcasting they never actually record a podcast! More than anything it is important to be yourself – that’s all part of creating your brand. I am just starting podcasting but so far I received only positive feedback. Although I do not use any specific mic, the sound quality turned out to be very good. I do not really like the background music. It distracts a bit from what the podcast is about. But maybe it’s just me. It looks like the link for the “Snowball Microphone” isn’t quite working properly. Update that as you’re able? : ) – Excellent read, really enjoyed the tips. I’ve been wanting to do a podcast and being a bit of a technical neophyte, I’ve not had the guts to try. Thanks for this article, it really brakes pod casting down into nice, bite sized pieces. And, we also do custom jingles as well if you want to do something totally branded and owned by you. We’ve done it for major advertisers like American Express, Starburst, HP, MetLife and Nike to name a few. Thanks for the great podcasting tips. I really like how you suggest we don’t go out and buy expensive equipment until we know we’re going to stick to podcasting for the long haul. That’s good advice. @Lisa: I remember once hearing the expression that success is only 20% mechanics: in an area like podcasting, there just might be some truth to that. @Simona: I knew I was taking a bit of a risk with that music – which btw was free from Incompetech – I just didn’t want it to sound bland and I always liked the podcasts that put some music in the background to create atmosphere. Guess its not to everyone’s tastes. @Jonathan: Thanks. You can find the microphone at the Apple store, or ebay or amazon.com. @T Edwards: I am a huge believer into breaking everything done into linear, bite size steps. It’s impossible to get overwhelmed when the next step is laid out so clearly before you. @Mike Collins: You’re welcome: The 7-15 Podcast Rule is a great buffer against overthinking the mechanics of your podcast when you should be focused on the more intangible things like your passion, your message and just getting started. You had given us some valuable tips to start out in podcasting. I got to check out your Podcasting Manifesto soon. Ok, I just saw this and its late but I will definitely add my .02 cents ad naseum on this topic. Its our heart blood. But after I grab some shut eye, I plan on adding to this thread…you can guarantee it. Do you find that say in this instance more people listen to your podcast or read the post? Do you track this information. I have been interested in pod casting for a while just never got round to integrating it but I really see the potential of it for the future of my site. It is tough when you work from home to keep on top and implement all of these ideas. @Internet Marketing: Looking forward to it. Sweet. I will have to bookmark this and come back to it when I start doing podcasts. I’d love to get into podcasting again. I used to do it a few years ago when I did a weekly unsigned music podcast but I don’t like people hearing my voice. I used to do it a few years ago when I did a weekly unsigned music podcast but I don’t like people hearing my voice. @Katie: An idea that might assist is rather than having a long drawn out process of creating a podcast is just getting your mic in the mornings or evenings, saying the name of your podcast and site at the beginning and end of your presentation and just having a “mental dump” about a particular topic and then immediately publishing it. This might make the process of podcasting much more of a cathartic enjoyable process as opposed to another chore that must be done. @Dean: It’s a very common problem but fortunately very few podcasters, myself included, have a smooth silky voice like Barry White to marinate the airwaves with so if nothing else, remember you share company with many people who don’t like their voice, but podcast anyway. I have always been enjoying podcasts produced by Yaro. After listening to this podcast, I am planning to create my own podcasts. Nice job, Mwangi! @Vera: I hope you read one of my comments above, you can do what Yaro has been doing in his recent podcasts and rather than having theme music, just give your site promo at the beginning and end of the presentation and then just start talking/interviewing and as soon as you’re done just publish it. Outsourcing is always an option, and as soon as you have a reliable freelance guy and a formula – e.g. put track 1 in the beginning, put track 2 in the middle, put track 3 at the end, remove all uummss, aahhhs and unnecessary pauses, write a brief intro and summary of questions answered and publish it on my WordPress blog – it can be as simple as finishing recording and then immediately emailing it to your freelance guy and forgetting about it. I am not sure I fully agree with this piece. While much of it is absolutely right, I don’t think distribution of one’s podcast work is fully covered. I have produced over 250 podcast episodes with a well known online radio network. Because this network is so well known, distribution of my work is enormous and extremely simple. While I do not “own” my podcasts, I do own ideas that go into the work. For me, a podcast is an advertisement, a display of my expertise. It works. I don’t know how I would feel about doing podcasts if I wasn’t sure a critical mass of people were listening. Podcast Away! Do it….get on the mic. I personally love what we do so when I hear Yaro do a piece on Podcasting I always take the extratime to check out the goods he has regarding the golden nuggets he’s found. That’s the beauty of the net, that we can’t do all the research on an individual level, but as a collective,. the nifty things we find. Rocks my world! Awesome tips, Mwangi. I always thought that podcasting is complicated. But after reading your article, you made it seems simple. Will definitely try this sometime. Thanks. Podcasting is both an art and a science. These days, most software take the hard work out of making people sound good. However, there is nothing more than a smooth set of vocal cords and wit and charm with timing that can take the cake. @articles: You appear to be suggesting that distributing using a podcast hosting/online radio service is automatically linked to critical mass or popularity whereas those are two separate concepts. Many of the podcasts on free podcast networks struggle to get listeners whereas many free podcasts, I know of at least 7, not to mention Entrepreneur’s Journey podcast, are published independently and yet get huge numbers of listeners. Those two ideas are not automatically linked and chances are if you’re getting all those listeners it isn’t just because of the access the free network gives you but probably your content + marketing: if that’s the case then whether you were on a service like blogtalkradio or just going it alone, you’d still succeed. @Internet Marketing: That type of enthusiasm can be infectous. @SEO101: Interistingly enough, a lot of people who even lack any of those things, excluding the charm obviously, still do quite well podcasting. That’s taught me heaps about a technology I know nothing about! @Cashmere: Glad I was able to teach you a little bit more about a pretty cool tool. Lol, but beyond the quote, some very good points about podcasting…I just redesigned my blog, so soon I’ll be integrating more forms of media, so this info definitely helps! @Classifieds and @Earn: Glad I could be of help. This is also true in my experience. Following this single, simple tip can be the difference between average podcast/blog/site and the MOST successful one in that niche. Once you put yourself in the mind-space that you want to dominate something it allows you to stretch your energy and literally have a whole different approach to marketing. Hi Mwangi and Yaro! Thanks to you now I possess good knowledge for starting my own podcast, first-class quality podcast!! Now I am going to create it! @Andy: I am glad you found value on the post. I think its very important that we think not only of our passions but areas where we are naturally inclined to dominate: Mike Filsaime talks about the same idea as well. @Peter: Godspeed with that! Maybe once its done you can come back here and leave us with a link to the first podcast on this comments thread. I really like Yaro’s podcasts. It’s a good start for those new to blogging and making money online. thanks for the tips..have been wondering how podcast are made as am interested to add postcasting to my own site. @Dominique and Camillion: Hopefully these tips plus the free stuff on my newsletter will be all you need to get you started. Hey thanks Tony for sharing such meaningful secrets of podcast. Now I am looking forward to make my own podcast. WOW! That was a great example of a quality podcast! I love the background music, the clear sound of your voice, and the easy steps. Before I landed on this page, I read “Podcasting Hacks” and have been putting off getting started, but now you have inspired me to take the leap! Excellent post. I was inspired to start my own podcasts on iTunes and on the blog after listening to Yaro. This post provides excellent tips for improving it, thanks. One thing which I’m unsure about is the best service to host my podcast. I’ve heard AmazonS3 is good. Where do you get your audio hosted? Do you host on your own server? 2) Hostgator: They now offer unlimited hosting as part of their domain name/hosting packages, which means once you sign up with hostgator, you never need an external storage service again ( though should you ever, jump over to Amazon S3 as soon as you can). So go online, Google ” Hostgator COUPONS” get yourself a discount on domains and hosting and give it a go. 1) Cost effective as compared to paying for increased or dedicated hosting when the volume of data moving goes past a certain amount. Though I am yet to fully test it, I would imagine unlimited hostgator hosting might be able to offer these things, though I would definitely love to hear feedback from anyone who has used the service to host videos. I love that you mentioned Voice 123 for the voiceovers as I’m a talent there. They have voices for every budget so no matter how small your podcast is, you should be able to find someone at a very reasonable price. I personally can be found at http://www.voice123.com/catsmith, but there are hundreds of demos to listen to, and you can just put out a general- I need this- audition listing. That’s true that you must have good microphone, i have experience that i need to reply many comment because sound of the podcast. Thanks for the other number of tips, i think the number 2 secret is very important.